HERB is cooking something up for us in the kitchen — the ability to learn how to work in clutter. 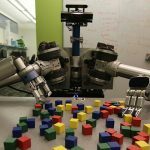 Read about how HERB has shown that robots can learn how to navigate through a mass of objects in order to get their work done. Clutter epitomizes the unpredictable world we live in, and whilst we quite probably navigate this clutter without thinking about it, it represents a significant challenge for more artificial intelligence. A team from Carnegie Mellon have developed some software to try and help robots tackle such environments. What’s more, the algorithms had the added benefit of bolstering the creativity levels of the robots involved. The team had installed their new ‘thinking’ capability into the Home Exploring Robot Butler (HERB) that they’ve been working on for a number of years. The researchers glean with pride when explaining that HERB was capable of things they had never taught it to do. For instance, it used the crook of its arm to cradle an object that it then moved. It’s a maneuver that it was never intended to know how to perform, yet it mastered it anyway. The algorithms have also been tested on NASA’s KRex machine, which has specifically been designed to navigate the lunar surface. So, whilst HERB was navigating clutter in an indoor environment, KRex was traversing an obstacle filled outdoor playground. In both environments, the robots were adept at navigating the terrain whilst performing the kind of pick and place procedures that are commonplace in robotics. The team believes this opens up a world of possibilities, such as in factory environments or even a child’s playroom where robots have to perform in uncertain environments. The team hopes that developing these capabilities will help robots function in environments that we don’t normally associate with being cluttered. For instance, collecting an item from a cupboard often involves nudging other pieces out of the way to both get and retrieve our desired item, but we probably wouldn’t associate our cupboards as being cluttered. What’s more, the machine is programmed to appreciate the world it’s operating in. So it knows, for instance, that certain items should not be forced out of the way in case they break or are squashed. The work is far from complete, however, with the next stage to try and build in a more tactile approach to object manipulation that can send feedback to the machine’s brain in real-time so that it can reassess on the fly. With robots being increasingly deployed in domestic environments, however, it’s nice to see the robot butler gaining functionality. The Future of Artificial Intelligence: Is Your Job Under Threat? Published at DZone with permission of Adi Gaskell , DZone MVB. See the original article here.